You must make reservations at least 5 minutes in advance of the time at Fog Room. 2nd Ave and Stewart St. Valet and limited street parking are available. We are immediately adjacent to the public garage on the corner of 3rd Ave and Stewart. *Discounted valet available with validation, please speak with valet for details. Located on the block between Westlake Station and Pike Place Market, just off the 3rd Ave bus corridor. 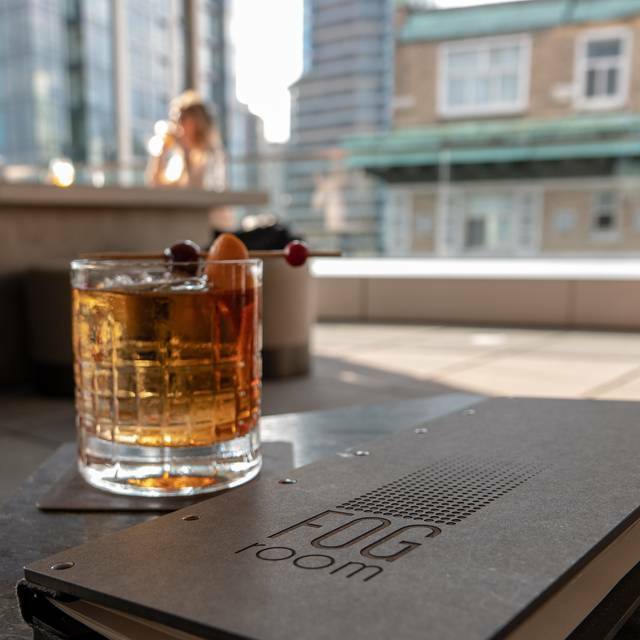 Seattle's only all-season rooftop lounge. Fog Room offers creative cocktails, wine and beer alongside delicious small plates in a comfortably luxurious indoor-outdoor space perched 16 floors above the hustle of 2nd Ave. Views of Elliot Bay and the city abound. No reservations Friday - Saturday on a first come, first served basis. Please call for parties larger than six. Food is incredibly overpriced for the quality and service is slow. They didn't add a main ingredient to one of our dishes and instead of correcting it, they just brought the ingredient over and made us put it on ourselves. So weird. Views were spectacular but the drinks were incredibly expensive and for no good reason at all. I would definitely go back, but only for a special occasion. One of the top best bar experiences in Seattle. A really good place to chill or go on a date to. Servers are good folks who dont disturb unecessarily and come to you only when you require their assistance. Food portions are on the lower side with limited good options. Tough to eat dinner here, unless you are expecting small plates. More like great view, drinks and appetizers. Worth seeing, but if you are hungry, tough to get enough food. Enjoy great views while enjoying a finely crafted cocktail or glass of wine. Fog Room is upscale while still being a comfortable place to enjoy conversation with a date or group. Highly recommend. The Kingslayer is an excellent choice for a craft cocktail. We didn't select anything off the food menu, and the survey doesn't offer you a neutral option. There is a limited menu for those who are dairy-free / vegetarians (olives or fries). We made reservations for dinner knowing it was a tapas approach with good cocktails. All the seating is low bar tables that are like tiny tree trunks so you're effectively eating on your lap. We decided to sit at the bar instead. The food is protein based, but incredibly tiny portions. Tiny by tapas standards. And super overpriced. As a former restaurant owner and former F&B manager, the value was not worth the price. We ended up having a second dinner up the street instead. Bartender was great and drinks where solid. Great place to relax and get great service! Food was delicious, but pricey! The entree portions were really small. Better to order off the appetizers tapas style. Service was great! A small group of four of us came in for drinks and a snack before heading out to dinner. The bar is on the 16th floor of a hotel. The vibe in the bar was cool with couch/soft chair seating near the windows. Currently, the view is great. Some of this great view will soon be blocked, as another high-rise building is being constructed across the street. The bar has a really cool outdoor area with a gas fire. The drinks were good and we had the french fries. We will be coming back again soon. Wow I could make a reservation for a window table for cocktails! Bunch of managers standing around looking down on you. Server has the whole room to take care of and just a bunch of do nothings standing around being awkward. Food was over salted and looked like prison slop. 10+ dollar drinks named after WWE wrestling star’s. The whole hotel is cheap and if not for the front desk woman named Melissa our time would have been poorly spent. Melissa was a jewel but she was only bright spot. Service was first rate. A little disappointed in the view from where we were sitting, but I think when it is nice enough to sit outside, the view will be incredible. Food was also very good. My wife and I live one block away and were excited to try th Fog Room. We were not disappointed and have been twice. The view and the cocktails are the main attraction for us. Plus you can reserve a seat anywhere including around the outdoor fire pit. So fun and so Seattle. Good job Charter! The windows give a great view over Elliot Bay and the Olympic Mountains in the distance. However it is as the4 cost of being blinded. If you have a table in the sun it is a bit overwhelming. Even if you turn your back to the sun they have mirrors on the other side so you get it either way. They said shades were already ordered. Also they require OpenTable for reservations, would be nice to call directly. On the up side the staff was super friendly and helpful. The food (we had nibbles) was top notch, and the bar menu was voluminous. The drinks we sampled was also top notch. I would highly recommend the Fog Room but reserve if you go in the Happy Hour. And if you are sensitive to lots of direct sunlight ask if they have gotten the shades yet. The View! Some of the best of urban skylines in Seattle. The service - they care a lot, are skilled, and a 20% tip is automatic and clearly pointed out to you (I approve). The drinks. Great craft cocktail list Jesse, and thank you Miles for your gracious service and mixologist skill. Food is small bites and plates, but you aren't going to find much better than this in the city. You can go out on the patio and be in the hub of the energy and higher noise if that's your vibe, or go back inside to varying levels of seclusion on stylish couches and chairs if you prefer it quieter. It would be easy to bring a small group here and be able to sit comfortably with good interaction. It's nice to have a place where you can dress up a bit more and not feel out of place. No dress code that I'm aware of, but you'll see men in hip suits and women in heels and relaxed cocktail attire. They're new on the scene so they're probably a bit overstaffed at the moment for a weekday, but that is a good thing as they dial in their program. It's clear they want to make a good impression as a team, and they did.